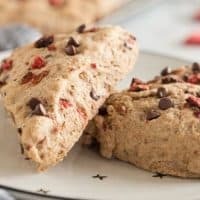 Vegan Scones are the perfect way to amp up any morning, whether a slow Saturday morning with a mug of steaming coffee or a weekday rushing out the door with a special treat in your hand. Vegan scones hit me like a ton of bricks this weekend. Well, a fluffy pillowy ton of bricks, that is. If you happened to see my Instagram post over the weekend, you’ll know that I’ve really been struggling with the fact that I’m still really not comfortable with vegan cooking and baking. It’s not that I can’t follow vegan recipes. It’s not that I don’t have the creativity or brain-power to make it happen. It’s that I literally have not had the time. 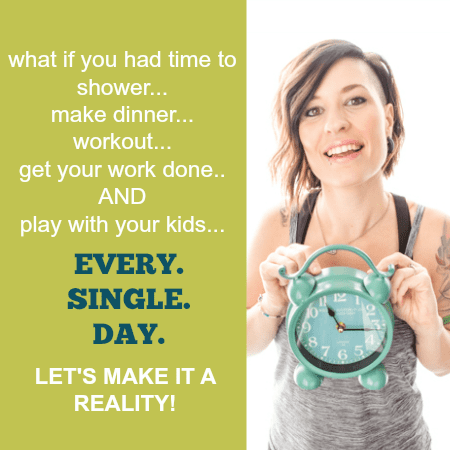 Unfortunately, we went vegan at a time in our lives when we’ve never been busier. Dinners have to be quick these days. Meals have to make enough for lunch and preferably leftovers for another dinner. The food I make has to have sticking power – I’ve gotta stay satisfied for a few hours at least. But going vegan means a lot more making food from scratch. A lot more prep. A lot more thinking things through. I’m not comfortable enough yet to just open up the pantry and fridge and throw ingredients together in hopes to produce a masterpiece. So yeah, I’ve felt a bit like a foodie failure these days. I felt like I’ve lost my mojo. I’ve lost my passion. I’ve lost my know-how. And then it hit me. Scones. I know scones. Perfect fluffy and moist, but dense enough to dunk into your weekend coffee without it crumbling apart on you. 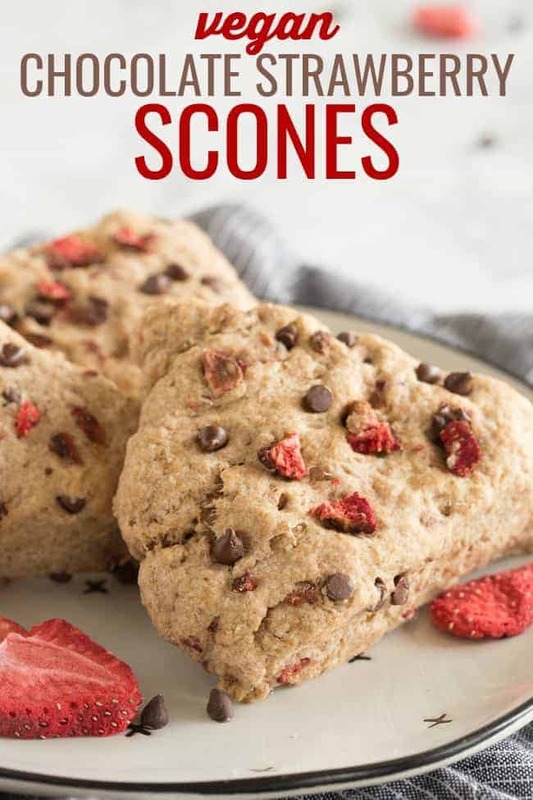 These are a few of my favorite scone recipes I’ve made. So I took a staple. Something I’ve made a billion times in my pre-vegan life and decided to just start playing the swapping game until we ended up with vegan scones. Vegan butter instead of butter. Almond milk instead of heavy cream. And for good measure, whole wheat pastry flour subbed in for the All-Purpose. The only way I’m going to be able to figure out how to cook in my newly vegan kitchen is to actually get in there and get my hands dirty. There are going to be fails. Fer.sher. But there are also going to be wins. 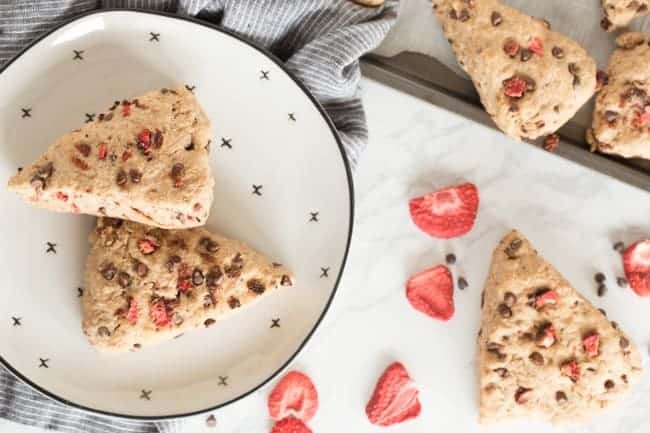 And my friends, I am so proud to say that these chocolate strawberry vegan scones are a total win that I made for you just in time for Valentine’s Day. 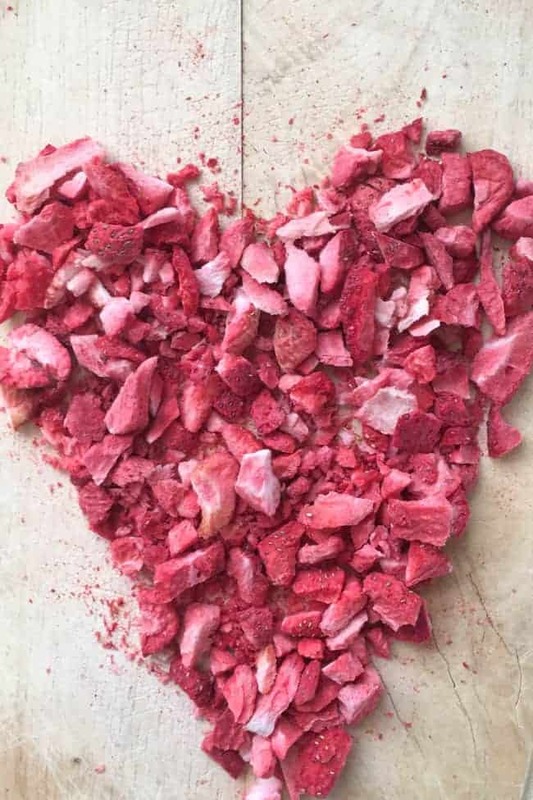 The bits of freeze-dried strawberries are a total compliment to the dark chocolate chips you get in every single bite. It’s almost like you’re getting a homemade chocolate-dipped strawberry, except you don’t have to go through all the time, work, and patience involved in that project. 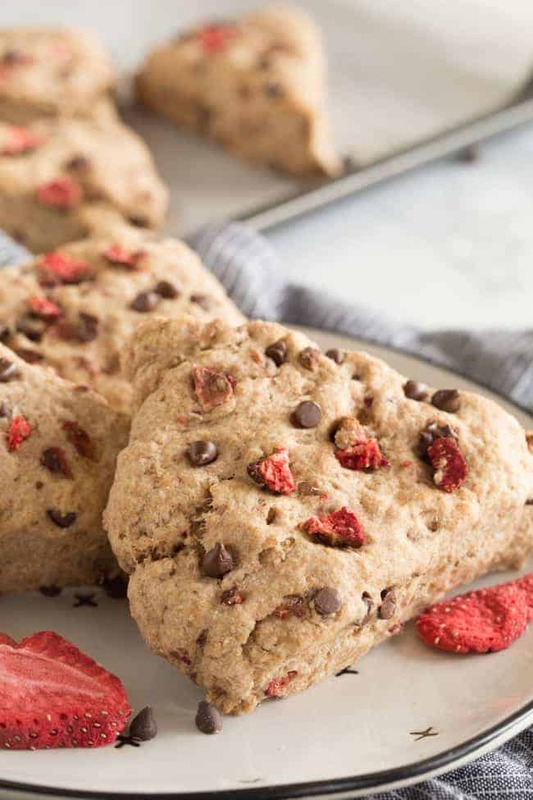 Vegan Scones may sound like a fancy affair, but they’re really the simplest of recipes. 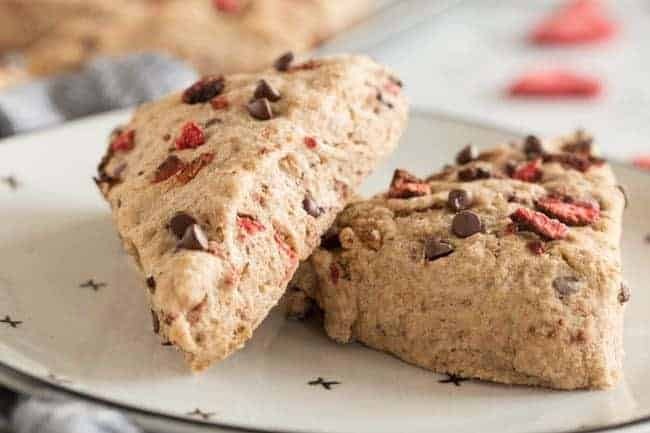 A great first vegan baking recipe to get under your belt if you haven’t jumped in yet. In a large bowl, mix together the flour, sugar, baking powder, baking soda, and salt. Drop the small squares of butter into the dry ingredients and cut in with a fork, pastry cutter, or even your hands until the butter is in small pea-sized balls and the flour is crumbly. In a small bowl, mix the non-dairy milk and lemon juice. It will curdle once you mix it. Add this to the dry ingredients and mix until just combined, being careful not to over-mix. Carefully fold in the strawberries and chocolate, again mixing only as much as necessary so the butter doesn't warm up too much. Lightly flour a clean work surface or cutting bowl and place the dough on top. Use your hands to form the dough into a circle, about 1 inch thick. Cut dough with a knife or pizza cutter into 8 triangles. Space them out on the prepared baking sheet. Bake for 14-17 minutes, until they have risen slightly and are firm on the tops. Eat immediately or store in an air-tight container for a few days.